Faside Stud breeds the highest quality dressage horses. We combine the excellent bloodlines of our mares with the best stallions in Europe to produce horses that have the potential to go to the top in their sport. We have a super selection of foals and youngsters available whether you are looking for your next dressage superstar or horse of a lifetime. By breeding the best to the best Faside Stud hope to produce horses who are sound, athletic and trainable. Temperament, rideabailty, long term soundness, expressive movement and correct conformation are the top priorities in our breeding programme. Every foal is handled from birth. They grown up in herds with suitable companions to learn valuable social skills and spend as much time as possible outdoors. All our foals are microchipped, DNA verified and passported. 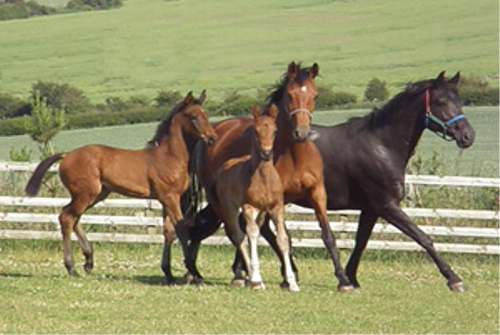 We started off breeding a couple of foals each year, keeping most of our fillies as future breeding mares. Our reputation has grown for breeding top class dressage horses and we have a great selection of nine available for sale. In 2014 we featured on the BBC! In 2019 we are expecting foals by Fursten-Look, Furstenball, For Romance II, Furst Romancier, Sir Donnerhall and San Amour. The first foal is due in April. Furstenlook was the 2014 Oldenburg licensing Champion, highest priced stallion and performance test winner. A his 30-day test his dressage score was 9,41 with 5 perfect scores of 10 for character, temperament, performance readiness, walk, and rideability. His canter and trot received 9.5's. He became Bundeschampionate in 2015. In 2018 he scored 84.05% in the WBFSH World Breeding Dressage Championships for 7-year-old Horses to place 3rd. Fürstenball was the winner of his performance test and champion stallion at the Oldenburg licensing, having sold for the record price of €110,000 as a foal. He was national champion of Germany and 2013 VTV stallion of the year. You can stay up to date with news through our Facebook, Twitter and RSS Feed! For Romance II was premium stallion of the 2015 Oldenburg licensing in Vechta. He is full brother to German national champion and PSI top price Fasine. Fürst Romancier received 9’s for all of his paces and 9.5 for rideability in the 70-day performance test in 2008. He became 2009 dressage Hauptprämie by the Oldenburg Verband for the quality of his foals. Sir Donnerhall won his performance test and was awarded Hauptprämire for his first crop of foals. In 2006, Sir Donnerhall was 5-year-old Bundeschampion and Vice World Young Horse Champion. He has trained upto Grand Prix level and is one of the leading sires on the German FN breeding valuation. San Amour was the dressage performance test champion, a premium stallion at Vechta, and the auction price highlight. He was placed in the finals of the Bundeschampionat and awarded Hauptprämie because of the quality of his first foals. For all purchases our terms of sale policy applies. Furstenball was champion stallion at his licensing and stallion performance test, Landeschampion and champion at the Bundeschampionship, champion stallion sire, winner of dressage advanced level/S level and VTV stallion of the year in 2013. In 2014, 3 of the 4 Oldenburg Landeschampions descended from Furstenball. The 3 year old mare Funf Sterne not only won the Oldenburg Landes-Reitpferdechampionat but also the Brilliantring of the Oldenburg Elite mare show this year. Amelie, also a daughter of Furstenball won the silver medal at the Elite mare show. The first progeny have won Reit- and Dressurpferdeprüfungen and have brought their sire into the top group of the FN breeding value estimation with 170 points. Sir Donnerhall is the sire of World Champions, winners of the Bundeschampionship, auction price record setters and licensing champions. He has sired 89 licensed sons. Sir Donnerhall combines the famous cross if Sandro Hit x Donnerhall. Sandro Hit's breeding record includes more than 180 licensed stallions, Champion Stallions, championship candidates, Grand Prix winners up to Olympians. He sired 11 Bundeschampions including the two-time Bundeschampion Poetin, who was sold for 2.5 million Euro. Sandro Hit was Bundeschampion and World Champion for six-year old dressage horses. His dam, Loretta, also produced Grand Prix winner Diamond Hit and Royal Hit and for this reason she might be the most influential mare all around the world of her generation. Bordeaux descends from one of the best mare lines in to world and he combines the best of Dutch and German breeding. He won the KWPN licensing in 2009 and then won the stallion performance test in Ermelo. He came 4th with Eva Moller in the World Championships for 6 year old dressage horses in Verden in 2012. Foundation is a powerful, uphill stallion who scored a 10 for both trot and canter at his performance test. He qualified for the Bundeschampionat in Warendorf in 2013. With Matthias Alexander Rath, Foundation has been competing successfully at Inter 1 level. He was awarded the dressage Hauptpramie from the Oldenburg Verband for the best first foal crop and has sired auction price highlights and numerous licensed stallions. Delatio is a grand prix stallion with excellent rideability and temperament. He won the Adelheidsdorf performance test in 2007. Under Miranda Rongen, he qualified for the Bundeschampionat and won at Prix St. Georges and Intermediaire I level. He now competes at grand prix with Bianca Kasselmann. Vitalis was first reserve champion of the main NRW licensing in 2009, dominated the dressage index of his stallion performance test in 2010 in Warendorf and, at an early age, notched up wins and placings at the Dutch stallion championships and at the World Championships of 5-year-old dressage horses in 2012. With Charlotte Jorst he was placed in the finals of the World Championships of 6-year-old dressage horses. Shortly after he dominated the US championship in his age-group with record marks of 10.0 for trot and 9.8 for canter. Since then he has been trained up to advanced level and is successful up to Intermediaire I. Johnson was the champion of the KWPN stallion show in 2005 and was 6th in the World Championships Verden in 2007. Johnson is a son of the keur stallion Jazz who performed at grand prix level with Tineke Bartels. Johnson descends from the 'Reina' line which includes famous horses Darkdream, Sultan, Kallisto, Mendel, Charmeur and Waldo. Furstenball was champion stallion at his licensing and stallion performance test, Landeschampion and champion at the Bundeschampionship, champion stallion sire, winner of dressage advanced level/S level and VTV stallion of the year in 2013. In 2014, 3 of the 4 Oldenburg Landeschampions descended from Furstenball. The 3 year old mare Funf Sterne not only won the Oldenburg Landes-Reitpferdechampionat but also the Brilliantring of the Oldenburg Elite mare show this year. Amelie, also a daughter of Furstenball won the silver medal at the Elite mare show. The first progeny have won Reit- and Dressurpferdeprufungen and have brought their sire into the top group of the FN breeding value estimation with 170 points. Sandro Hit's breeding record includes more than 180 licensed stallions, Champion Stallions, championship candidates, Grand Prix winners up to Olympians. He sired 11 Bundeschampions including the two-time Bundeschampion Poetin, who was sold for 2.5 million Euro. Sandro Hit was Bundeschampion and World Champion for six-year old dressage horses. His dam, Loretta, also produced Grand Prix winner Diamond Hit and Royal Hit and for this reason she might be the most influential mare all around the world of her generation. Metall is best known as the sire to European Champion and Olympic Gold Medallist Uthopia. His sire Ferro won the team Silver Medal at the Olympic Games 2000 with the Dutch team. He was placed sixth at the World Equestrian Games in Rome and second in the World Cup final 1999. Vitalis was first reserve champion of the main NRW licensing in 2009, dominated the dressage index of his stallion performance test in 2010 in Warendorf and, at an early age, notched up wins and placings at the Dutch stallion championships and at the World Championships of 5-year-old dressage horses in 2012. With Charlotte Jorst he was placed in the finals of the World Championships of 6-year-old dressage horses. Shortly after he dominated the US championship in his age-group with record marks of 10.0 for trot and 9.8 for canter. Since then he has been trained up to advanced level and is successful up to Intermediaire I.